Ahhh! What beats a cozy beach fire on a cool late summer’s eve? Sweatshirts standing by, but not needed quite yet. Just sitting on a comfy log, poking the fire with a stick. Mussels and shallots steaming in a pot of buttered beer. Smoked chicken and sausage with peppers and onions slowly grilling off to the side, and the company of family, and friends. To round out the pleasure, some Rauchbier, or other Smoked Beer to cool the fire’s heat and/or warm oneself against the cool sea breeze. Ahhhh! As beer is considered food, Rauchbier should be considered BBQ. Rauch (pronounced, rrrrowsch) is a fun German word to say. It feels German in every way. Burping while Bellowing out, “RAUCH!!! !” shows the world that you are a very sophisticated cosmopolitan traveler. 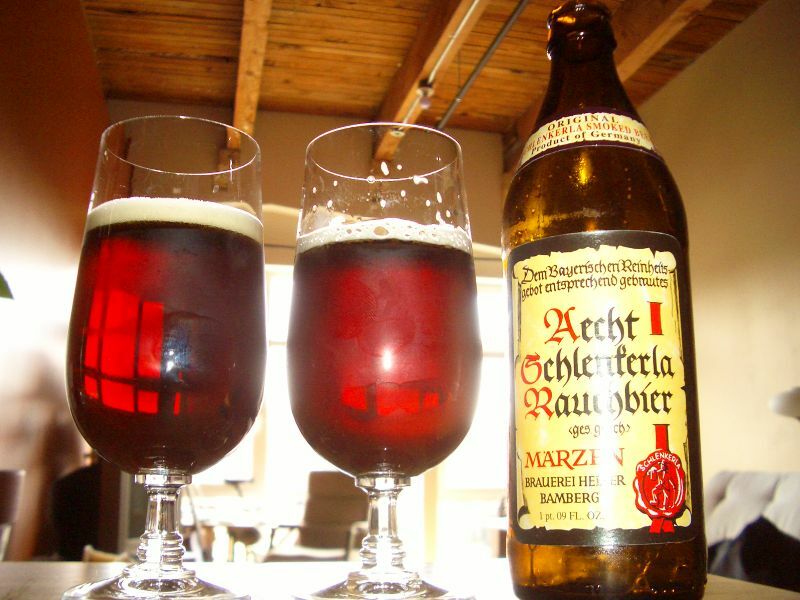 Originating in and around Bamberg, Germany in the 1500’s, the Rauch (Smoke) bier was created by roasting green malt over beech wood fires. Literally all beer must have had some smokiness as kilning ovens used to roast malts weren’t invented until the industrial revolution. That aside, it’s a style that nearly died out as brewers modernized and caved to the trends of the days. Thankfully, a few brewers in Bamberg continued brewing the style using traditional methods. Today, Rauchbier and other smoked lagers, Scotch ales and porters in varying degrees of smokiness are landing in our packies. The smokiness levels descriptions run the gamut from a faint wisp of smoke on the horizon to licking your chimney clean with your tongue. Smoked beer goes very well with, (drum roll please!) smoked meats and cheeses. Grilled and roasted meats, sausages and root veggies also pair nicely. This pours a rich dark teak color, and despite a rather hard pour, the mostly large bubbly head dissipates, forming a thin beige ring with very little lace. A wonderful smoky malt and slight hop and faint alcohol aroma lasts a fair amount of time, eventually giving way to a pleasant morning after campfire smell. Full bodied and lightly sweet and amply hopped. Robust Maltiness blends well with citrus and spicy hop bitterness. This is an acquired taste that I've acquired while tasting and rating this fantastic brew! Closely resembles an Oktoberfest with a deep smoky flavor and aroma. Its smokiness is more pronounced than its Urbock brother as a result of being less hoppy and about 20% less ABV. There is no missing this depth of smoke. Nice Rauchbier to nibble cheese with. The unusual tar tinted dark brown color requires careful examination. The full smoky (not overly so) malt is the star of the show. The fairly high hops with light a metallic and somewhat grapefruity bitterness deserve some attention as well. Lightly sweet with a dry edged body. A hint of dark chocolate and coffee offer contrasting flavors to offset both the malt sweetness and hop bitterness. A smoky edge is more apparent in the aroma than in flavor. A light hop floral bouquet and sweet malt give way to a comforting smokiness. The beige/tan head dissipates at its own slow pace then lingers as fine lace. Flavors merge, blend and congenially mingle together. Well Done! It pours a very dark mahogany with a thin beige head and leaves a fair amount of lace. A big smoky, malty aroma rises up and sticks around for a while. A smell of floral hops and hint of pine settle in the background, then fades away. Rich, lightly sweet malt is beautifully balanced by a pleasant smokiness. Espresso, dark chocolate and a bit of caramel sweetness, blend nicely with a wild and raw hop bitterness. A German familiar with his beloved Rauchbier may be disappointed in the lack of a powerful chimney-like smoke, but this lower percentage alder wood smoked malt is more subdued and reliant on the quality of malt and hop characteristics as well. 12oz dark brown bottle. No freshness date. Pours a dark amber cola color with an overly enthusiastic beige head, with lots of lacing. The smell is a unique mix of smoke, macerated berries, dried malt and resinous hops. A light whiff of rose petals and peat moss inch through. The flavors follow the smell. The tastes are carried within the fizzy effervescence, bursting with flavors which tantalize and tease the taste bud spectrum. Nice beer for a smoky BBQ! 12 oz. brown bottle. Freshness date etched on label. Served in a tall cylindrical mug. It pours an orange-hued amber with a real fast-fading off-white head and not but a few specks of lacing. The distant smell of smoke over a dry maltiness. A little citrusy and a bit of metallic hop aroma along with cut hay follows. The smokiness is at first subdued, but as it warms becomes more influential to the overall taste. Sweet malt and a lightly citrusy hop inch forward. It is very similar the Oktoberfest, except for the smoked barley malt. 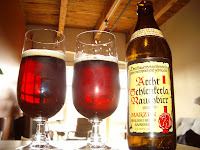 This is a very easy-drinking Rauchbier, and one I'm sure will bring more brewers into the mix. Coming soon, Imperial Rauch! It pours a dark leathery brown with a solid beige head and a fair amount of lacing. The aroma is largely of smoky malt, with some molasses and a bit of hops in the background. The malt is thick, lightly smoky and sweet, and a wee bit chalky for my liking. The hops are sort of lost within malt body. A mild tea-like bitterness doesn’t make a note-worthy impact. This brew lacks a peaty and Scotch-like quality normally associated with the style. 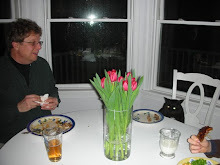 The presence of alcohol is barely noticeable, though the results of a pint are undeniable. Grab a couple different smoky brews and head out to your favorite campsite or beach fire pit and see if your perception or smoked beer doesn’t change drastically.